The other example is about a father and son, father needed to down size from the family home, and son who had space to accommodate the father’s new second dwelling built with a purpose built passage way between the sons house and fathers second dwelling for the single Dad to live in when he wasn’t traveling. The family home was rented out, which the son manages the property now, where the rental income from the family home is shared between father & son. If you already have a Granny Flat, go read How to make Extra Money from your Property and for those, who are thinking to build a second Dwelling then you may want to read further. So, Go build a Granny Flat or Second Dwelling (as they are officially called) or build a small dwelling to suit your needs, for an example, the 5×4 project. One clever build was the 5×4 Hayes Lane Project in Melbourne a 3 lever build on a small block of land 5 metres by 4 meters squared, a space the size of a parking bay which some home car garages are larger than 5 x 4 metres. Before to get too excited, the first call to make is to your local city council to ask for guidelines on building a granny flat or second dwelling. We enclose a few links to the Brisbane City Planning Guidelines and the Australian Government sustainable homes website. Link to Brisbane Planning for Guides to construct Granny Flats. Link to Brisbane City Plan. We want to buy but we just can’t afford to buy an investment property. As a number of our clients who own a home want to purchase another property to upgrade the previous home into an investment property to generate positive income struggle to find the right property due to property prices in a number of suburbs priced out of their reach. By the time they calculate the loan repayments against the income, just does not justify the purchase price for a positive cash flow income. The solution maybe a second dwelling or a small project build on your own property or a small build a small parcel of land. How to build a Granny Flat and where do I start. In the last few years, the town planning guidelines across Australia have changed to allow property owners build a second dwelling on their property as long as you have the area of land and obtain council approvals to do so. With the growth of our cities, while protecting our enviable way of life, City councils have realising to support the population and migration growth, Australian does not have enough available dwellings to accommodate growth in our capital cities. Australia needs more homes plus the affordability issue plus the demand for second dwelling submission with town planning, City Planning realise they need to relax city planning guidelines for small lots construction. From the different styles of ready built prefabricated modular styles to custom builds, the pricing will vary based on the style you require. To start with, a few design ideas for your project you may want to visit the granny flat finder website. Traditional costs to build a 150sqm low set home may vary from state to state, a build with Low Stranded Finishing’s average at $970 per sqm to High Standard Finishing’s at $4,030 per sqm to build. However, for a Second dwelling build price per square meter can vary from prices advertised as low as $900 per square meter. A 20-foot container style build can cost $10,000 plus transport fees, which are a 14 sqm internally space, exterior directions are 6.06m long x 2.44m wide x 2.6m high, which are offered by TransPack out of China. Below is the Washington Brown Quantity Surveyors website link to their building cost calculator, which may also assist with your calculators. 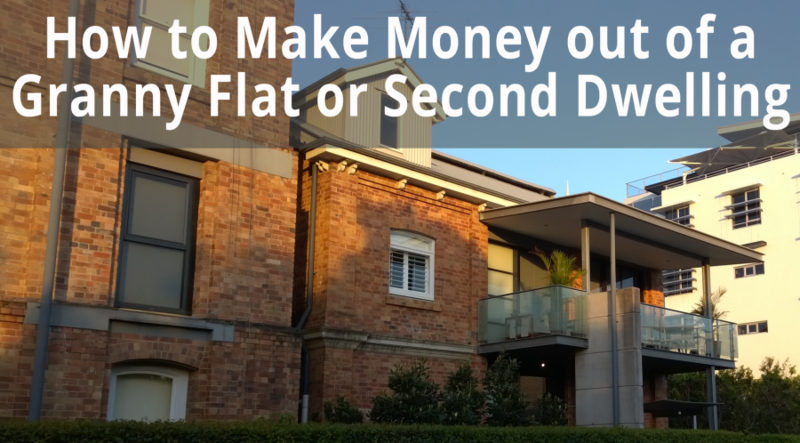 What income can I make from my Granny Flat? Call a local real estate agent to find out what the average rental rates would be for the type and style of dwelling you have. If you list your Granny Flat with a local real estate agent, they will charge for their services to manage your listing. You may wish to manage the property yourself but for some of us with minimal time on our hand, listing the property with a local agent may be the solution. For those who wish to manage the property themselves, the Flatmates website can give you a guide of current room incomes based on the location of your property alongside the rail line in your suburb. Below we list the Brisbane rail line rent incomes as a quick guide, so go visit the website to find your capital city incomes and you may be surprised on the income your Granny Flat or second dwelling may be able to generate. We hope this blog gives you a few ideas to work on your Granny Flat or Second Dwelling project.